© 2019 Bryanna Clark Grogan. All Rights Reserved. 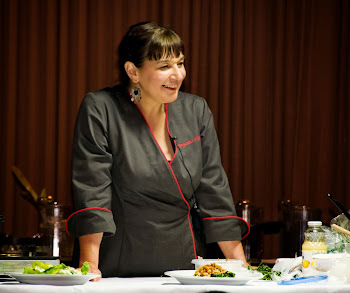 Here are some recipes that I developed for the Vegan Mainstream Cookbook Club as their "January Chef" in 2014. This entailed writing an article, with recipes and photos, and doing a video chat with the wonderful and patient Stephanie Redcross and Emma Laroque. If you'd like to see the video of the live chat, it's available here. It was fun chatting with Stephanie, who is in Georgia (USA) and Emma, who lives across the Straight, not far from where I live! 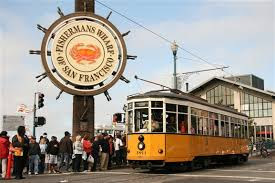 I grew up in California, most of that time in San Francisco, within walking distance to Fisherman’s Wharf. The majority of the rest of my life has been spent on the West Coast of British Columbia (pre-and-post-vegan). My father was Peruvian, with an Italian mother. These facts alone might explain why I have seafood cravings to this day, 25 years after becoming vegan. Some vegans, the ones who turn up their noses at any sort of replication of animal proteins, might say “get over it and eat some nori seaweed” (which I do from time to time), but inventing dishes is my craft, if you will. I can’t help being inspired by memories of the delicious meals of my past. I have a keen memory for outstanding meals—the tastes, smells and textures of certain dishes. Don’t get me wrong—I love beans and grains, nuts and vegetables, and we eat them regularly and enthusiastically. But certain dishes of one’s culture, family background, holiday customs, and where we grew up stick with us, conjure up wonderful memories and feelings of comfort and pleasure. To deny these feelings, especially those of another vegan, out of some effort to be “pure”, even when no animal is harmed, seems misguided to me. The pious Buddhist Emperor Wu (Wudi) of the Liang dynasty (also known as the Southern Liang Dynasty, C.E. 502-557), who donned monk’s robes several times throughout his reign, wrote an essay entitled "Forsake Alcohol and Meat", in which he urged Buddhists to become vegetarians. He modelled much of his rule after the Indian Buddhist Emperor Ashoka of the Maurya Dynasty (273 -32 B.C.E), establishing Buddhism as the state religion of China, and prohibiting monks from drinking wine and killing animals. From that time on, vegetarianism in China was linked with the Buddhist prohibition against taking life. To this day, many Chinese and Japanese Buddhists sects prohibit eating meat. Although tofu and other Chinese soy products are strongly associated with Chinese vegetarian cuisine, it is less well-known that wheat gluten may have been introduced into Chinese cuisine as early as during the reign of Emperor Wu (see paragraph above). The making of a sort of proto-gluten is described in the Chhi MinYao Shu ("Notes on Miscellaneous Affairs"; C.E .544[Liang Dynasty]). Gluten was mentioned over the centuries by many writers and scholars, even in novels, such as Hsi Yu Chi ("Journey to the West", C.E. 1570) and Ju Lin Wai Shi ("The Unofficial History of the Literati"— C.E. 1740.). This indicates that gluten was accepted outside of the circle of Buddhist ascetics. 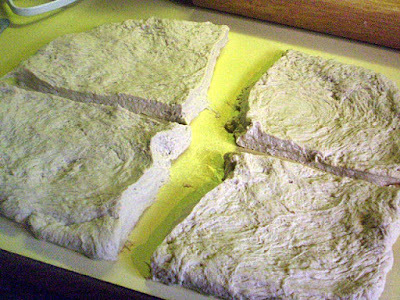 Recipes for cooking gluten are found in the major culinary works of the Yuan to the Qing (Chhing) Dynasties (C.E. 1279- 1912). 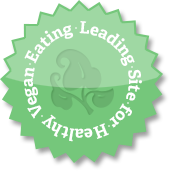 So, this is nothing new, obviously, and we vegan cooks who devise modern homemade meat and seafood substitutes have a great example and proud lineage to follow. He also points out how milk is not exclusively dairy-based anymore—there are bean milks, like soy; grain milks, like oat and rice; seed milks, like quinoa, hemp and flax; and nut milks, such as almond, cashew, coconut and hazelnut. Soy why not “grain meat”, “nut meat”, soy meat”, etc.? Delicious modern gluten/seitan/grain meat-based recipes abound on the Internet these days (often with the addition of other grain and legume flours), and in the pages of vegan cookbooks, but it’s difficult to find good recipes to satisfy those seafood cravings I was mentioning before. There are fewer seafood sub recipes online, and there are commercial products that I’ve read about, but they never seem to be available where I live. So I have had to devise my own recipes. 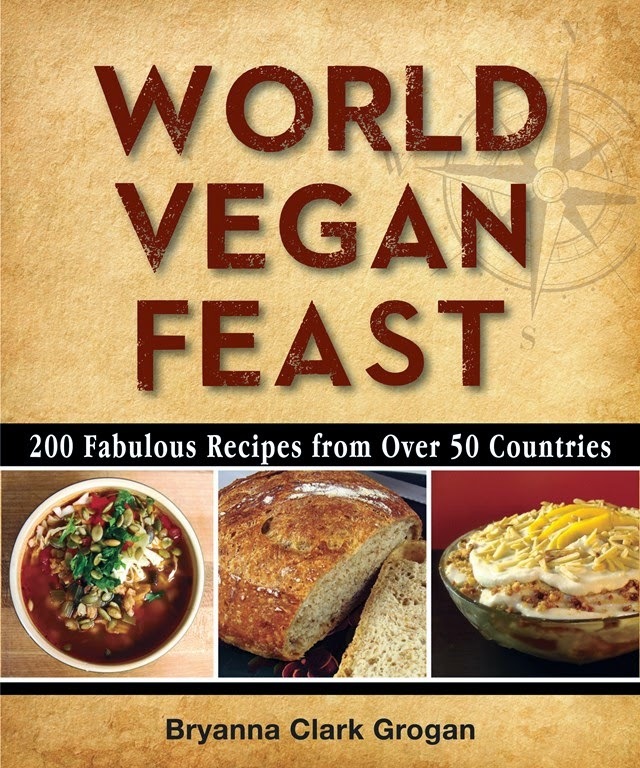 There’s a “salmon” recipe in my bookWorld Vegan Feast (Vegan Heritage Press, 2011), but what I miss the most is shellfish—not only the taste, but the texture. The basic recipe I’m going to share with you below is satisfying to me, versatile, inexpensive, freeze-able and relatively easy to make. (I’m also including some favorite recipes using the basic product.) I hope you will enjoy these homemade products as much as I do, and devise your own recipes for using them. Soak the mushrooms and kombu in the boiling water, covered, for about 30 minutes, then strain. Freeze the mushrooms for future use in recipes, if you have no use for them right away. Discard the kombu. 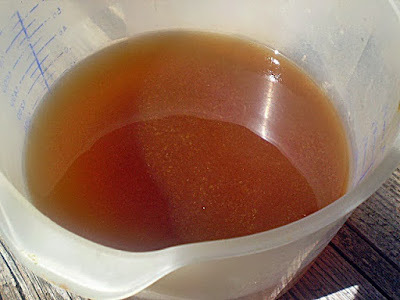 To cool off the broth quickly, place it in a shallow dish or bowl and place in the freezer until cool. DO NOT use hot broth in the Wet Mix! Hot liquid will make the seitan stringy. For the Wet Mix, blend all of the ingredients until very smooth in a blender or food processor. Mix the Dry Mix ingredients in the bowl of your electric mixer with dough hook attachment, or place them in the bread machine in the order given. Add the cooled Wet Mix and knead for about 10 minutes. 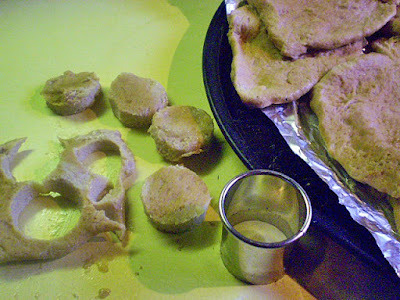 (If your bread machine has a dough cycle-two kneads with a long rest in between, use that cycle. Otherwise, just run it through the kneading part and then unplug it and let it rest in the covered container, then plug it in again for another knead, then remove it.) Let rest for about 1 hour, covered. Cut as many rounds as possible out of the cooled seitan squares with a 1″ wide or slightly smaller round cookie cutter. (I had to buy a set of round cookie cutters in order to obtain one of this size). 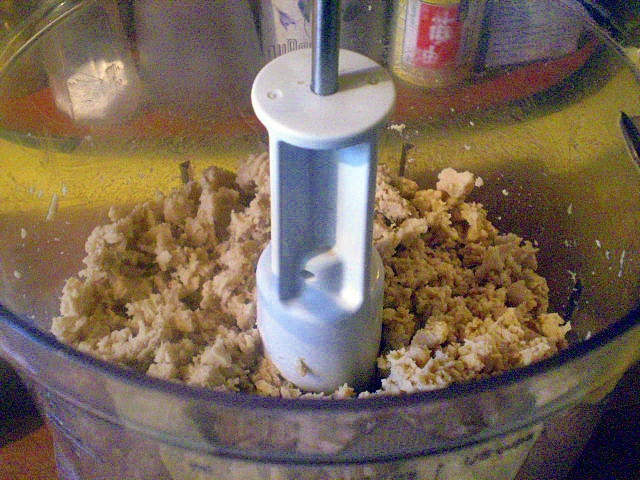 Grind the scraps coarsely in a food processor to use for Chopped Sea-Meat (clam substitute). NOTE: All seitan freezes well. Nutrition (per serving): 98.3 calories; 22% calories from fat; 2.6g total fat; 0.0mg cholesterol; 140.0mg sodium; 73.8mg potassium; 5.3g carbohydrates; 0.5g fiber; 1.3g sugar; 14.1g protein; 2.1 points. White "Clam" sauce using ground "Sea-Meat"
This is a “veganization” of an old favorite from my childhood. I cut the olive oil down as far as I could, but you MUST have some in this sauce! 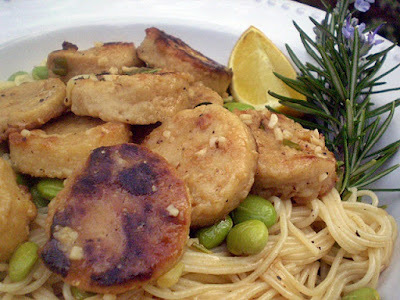 You can serve this with a vegan parmesan substitute, but this type of dish is normally eaten without cheese. Place a large pot of water on to boil for the pasta. Heat the oil in a large heavy skillet over moderately high heat until hot but not smoking. Add the onion, stirring, until starting to be golden, about 4 minutes. Add the garlic, and optional herbs, if using. Cook, stirring occasionally, until garlic is golden, about 2 minutes. Stir in the Vegan “Sea Stock” and wine, and boil, uncovered, stirring occasionally, until slightly reduced, about 3 minutes. Cook the pasta in the pot of boiling salted water until al dente, then drain in a colander. While pasta is cooking, stir the Chopped Sea-Meat into the sauce and simmer, covered, stirring occasionally, 4 to 6 minutes. Remove from heat. Taste for salt. 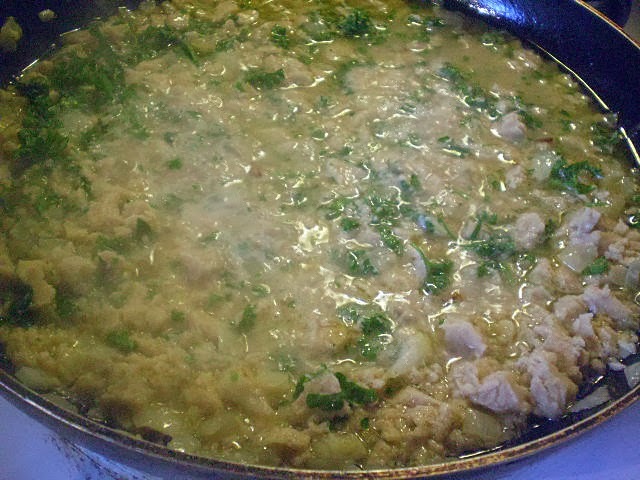 Immediately add the drained pasta to the sauce along with the parsley, then toss until combined well. Add optional pepper, if desired. Serve immediately. Nutrition (per serving): 551.0 calories; 22% calories from fat; 14.3g total fat; 0.0mg cholesterol; 440.0mg sodium; 338.0mg potassium; 77.9g carbohydrates; 3.5g fiber; 4.3g sugar; 23.8g protein; 11.5 points. BRYANNA’S VEGAN “SEA STOCK” © 2019 Bryanna Clark Grogan. All Rights Reserved. This is a handy recipe for vegan “sea-meat” recipes. Simmer the mushrooms and kombu, covered, in the water for 30 minutes. Strain in a colander. Save the mushrooms for another dish, if you like. Discard the kombu. Stir in the miso, vegetarian “oyster” sauce, and salt. Dissolve thoroughly. Strain through a fine sieve. Refrigerate. Nutrition (per 1/2 cup): 18.6 calories; 6% calories from fat; 0.2g total fat; 0.0mg cholesterol; 318.5mg sodium; 75.3mg potassium; 4.3g carbohydrates; 0.6g fiber; 1.5g sugar; 0.7g protein ; 0.3 points. 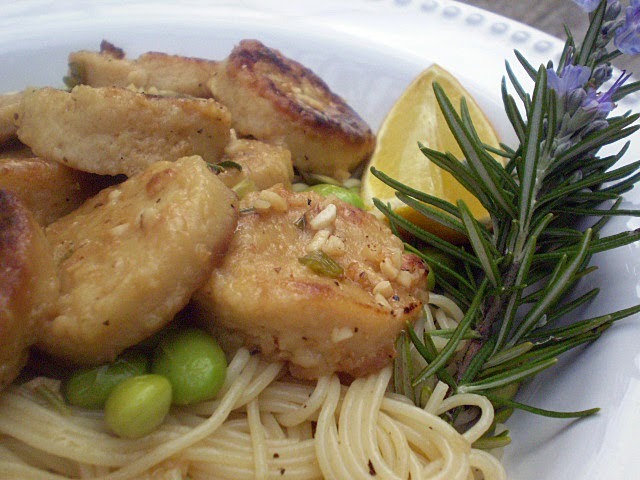 This is deliciously simple Italian way to showcase your Sea-Meat Scallops. If you want a more “fishy” flavor, add a tablespoon or so of dulse or nori flakes to the sauce. Place a large pot of water on to boil. When it boils, add the pasta and the thawed edamamé to the water and set the timer for 4 minutes. In a bowl, mix the Seasoned Flour with the Scallops until they are all coated. Heat the olive oil in a large, heavy nonstick skillet. When hot, add the Scallops, green onion, and the garlic and quickly stir-fry over high heat until the Scallops are slightly seared. Add the Vegan “Sea Stock”, wine, herbs and salt and pepper to taste (and the “Oyster” Sauce and seaweed flakes, if using) to the skillet. Cook briefly at high heat. Drain the pasta and edamamé when done and add to the skillet. With a large spoon and a pasta rake, toss the contents of the skillet while it cooks. You want the pasta to absorb most of the sauce, with just enough left so that it isn’t dry. 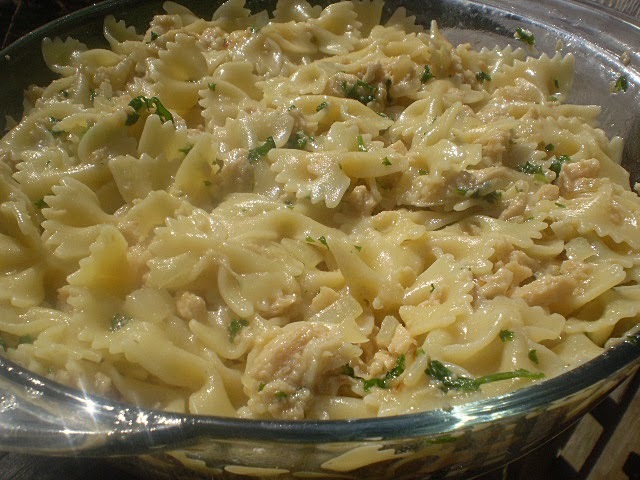 Quickly divide the pasta evenly into 6 warm pasta bowls. Serve with salt, pepper, lemon wedges, and vegan parmesan substitute. Nutrition (per serving): 478.0 calories; 20% calories from fat; 11.2g total fat; 0.0mg cholesterol; 338.8mg sodium; 602.4mg potassium; 61.2g carbohydrates; 5.5g fiber; 3.7g sugar; 55.7g net carbs; 25.5g protein; 9.7 points. Have some of this in your refrigerator at all times for costing vegetarian proteins before browning– it adds great flavor! OPTIONAL: 1 teaspoon onion powder, 1 teaspoon garlic granules and freshly-ground black pepper to taste. Other spices can be used, according to the type of recipe you are making. Mix together the flour, nutritional yeast flakes, salt, and, optional onion powder and black pepper, if using. Store in a covered container in the refrigerator. Nutrition (per 2 tablespoons): 50.4 calories; 5% calories from fat; 0.3g total fat; 0.0mg cholesterol; 105.7mg sodium; 89.6mg potassium; 10.2g carbohydrates; 2.1g fiber; 0.1g sugar; 8.2g net carbs; 2.7g protein; 0.6 points. This recipe goes quickly, so make the sauce first and keep it warm, and have the asparagus steaming while you fry the “Scallops”. To make the Lemon-Garlic “Butter” Sauce: Heat the first 4 teaspoons of vegan butter in a nonstick skillet over medium-high heat. Add the garlic and stir with a wooden spoon JUST until the garlic begins to turn golden. Add the broth and the zest and juice of the lemons. Bring to a boil over high heat. Turn down to a high simmer and cook it down to 1 1/4 cups (important!). Stir in the cornstarch mixture and stir until thickened. Stir in the remaining 4 teaspoons of vegan butter, if using. Remove from heat and cover to keep warm. 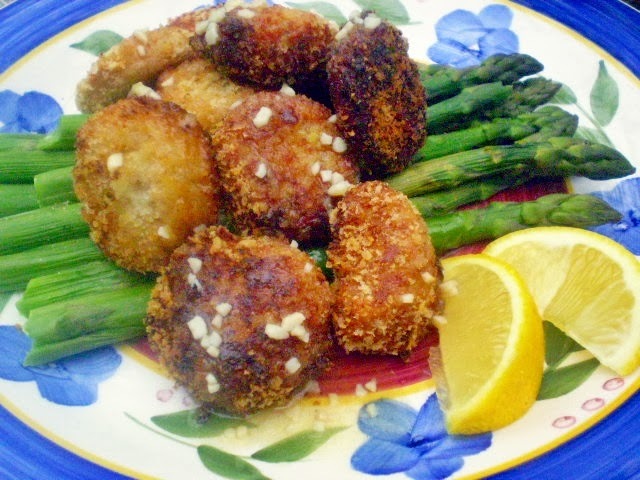 To fry the “Scallops”: While the asparagus is steaming, set up shallow bowls with the whole wheat flour, the milk and lemon juice mixture, and the panko breadcrumbs in a line on your counter. Dredge the “Scallops” in the flour, then the curdled milk, and then coat all over with the panko. Place on a parchment-lined cookie sheet, not touching. Heat an inch or so of oil in a large heavy skillet. When hot, add the coated scallops, turn the heat to medium-high, and fry until crispy on both sides. Drain on paper towels. To Serve: Distribute the steamed asparagus on 4 plates. Pile 8 fried “Scallops” over each pile of asparagus. Drizzle warm Lemon-Garlic “Butter” Sauce over each serving, and serve more on the side. Nutrition (per serving): 321.4 calories; 14% calories from fat; 5.3g total fat; 0.0mg cholesterol; 601.4mg sodium; 741.8mg potassium; 61.0g carbohydrates; 9.9g fiber; 11.7g sugar; 13.3g protein; 6.1 points. Chinese oyster sauce is a favorite flavoring, thick, rich-tasting, and slightly sweet. I use the vegan version frequently to coat plain tofu for use in stir-fries and fried dishes instead of chicken, and, of course, it’s essential in some Chinese dishes. 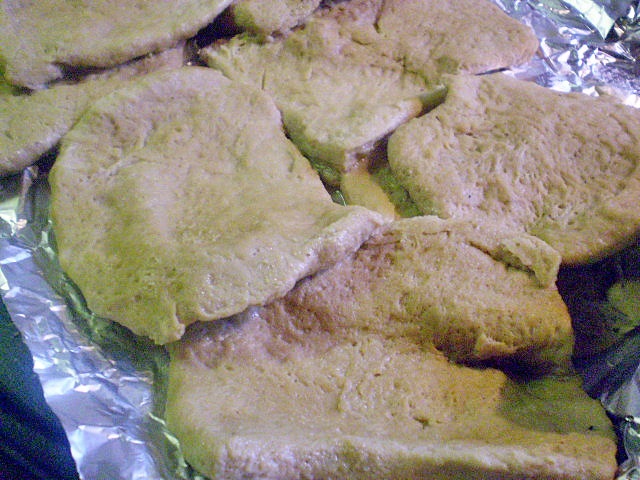 As well, it can add rich flavor to homemade seitan/grain meat. If you can’t buy it, it’s easy to make a very acceptable substitute. You can find commercial vegetarian versions, made with mushrooms, in some Asian groceries and large supermarkets (and online, including at amazon). Sometimes it is labeled “vegetarian oyster sauce” or “mushroom oyster sauce”. It is also marketed as “vegetarian stir-fry sauce” (Lee Kum Kee brand). It keeps for a long time in the refrigerator. However, it can be difficult for people in some areas to find, so I am giving you a recipe for a homemade version. NOTE ON MUSHROOMS: For the dried mushrooms, you don’t need expensive shiitakes—just use the inexpensive dried Chinese mushrooms (or Chinese forest mushrooms) that are easily available. Snap off the stems and discard them, then grind the mushrooms to a powder in a DRY, clean blender or coffee/spice grinder. Pour into in a medium saucepan and heat to boiling over high heat. Add the dissolved cornstarch and stir until thickened. Cool and store in a covered jar or bottle in the refrigerator. Since it is quite salty and sweet, it should keep for several months. NOTE: You can, alternatively, microwave the mixture, with the cornstarch, in a medium bowl and cook on 100% power for about 1 minute, then whisk. Repeat until thickened and store as above. It's been about 2 1/2 months since I last blogged. There are various reasons for this-- some "blogger burn-out", I suppose you could call it, after 12 years, first of all (13 years, actually). And then, there's been a fairly big change in my diet and how I cook now, since I was diagnosed as pre-diabetic last year and now eat a low-glycemic diet. (See blog posts from March 2018 and on, particularly this one.) I'm not on a low-carb, or no-sugar, or vegan keto diet. 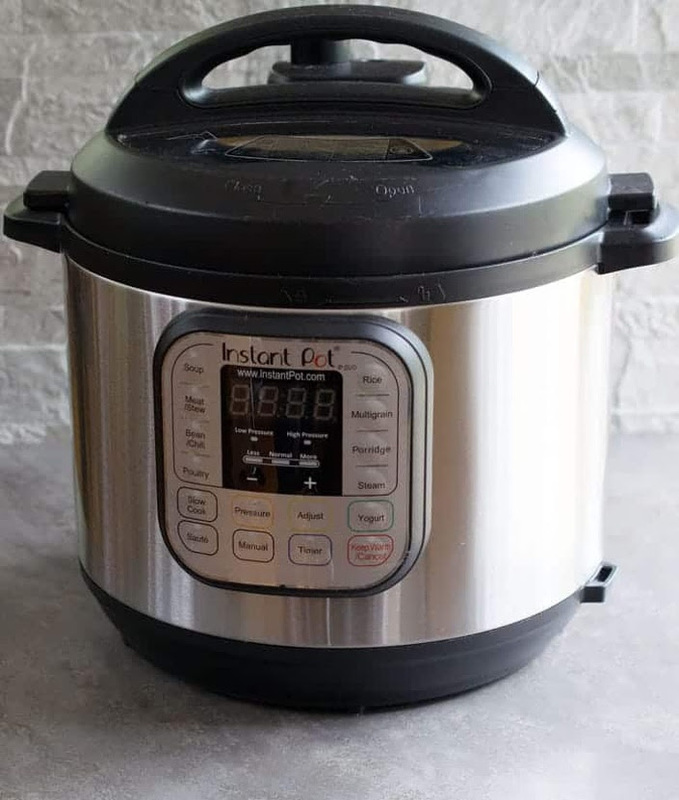 I've just been learning to cook with low-glycemic and high-fiber grains and flours, and fewer sweets, and also learned about "resistant starch"-- see this post. Just as I was feeling like blogging again, I developed a case of shingles! This has laid me low for over a month now. It is improving, but my energy has been pretty low. I'm hoping that I'll be back to normal in a couple of weeks, but it's hard to predict. But, at least I've had a little more interest in cooking again. Lately, I've been working on developing some truly good low-glycemic rolled biscuits, but I haven't got there yet! (Stay tuned.) I've also been working on a good high-fiber, low-glycemic, not too fatty or sweet chocolate chip cookie recipe. My goal was also to make it easy to make, using readily-available, inexpensive ingredients, and of course, to make cookies that still tasted like a treat! So, I'd like to offer you my latest version, which I'm quite happy with (but, you never know-- I might refine them further). I hope that you will enjoy them, too! These also happen to be GF and soy-free, too, though I do not purposely avoid either of those things. Preheat oven to 350°F. Line a large cookie sheet with baking parchment. In a medium bowl, mix together the Dry Mix ingredients with a whisk. Mix together the Wet Mix ingredients in a 2-cup measuring cup-- this works best with an immersion/stick blender. Add the Wet Mix to the dry mix and stir with a spoon. Then add the chocolate chips and nuts (if using). Scoop the batter out with a 4 tsp. measuring spoon, slightly rounded, and drop a the dough "blobs" a couple of inches apart on the parchment-lined baking sheet, using a small silicone spatula to scoop the dough out of the spoon. then gently flatten each cookie a bit with a flexible stainless-steel slotted spatula (see below). Continue to bake for another 8 minutes. Remove the baking sheet to a rack and cool for 5 minutes. Then remove the cookies from the baking sheet to the rack and cool for at least another 10 minutes before serving. Labels: chickpea flour, chocolate chip cookies, chocolate chips, cookies, high-fiber, low-glycemic, psyllium "egg"